Automotive Plastics Market size was over USD 22 billion in 2016 and industry expects consumption above 20 million tons by 2024. 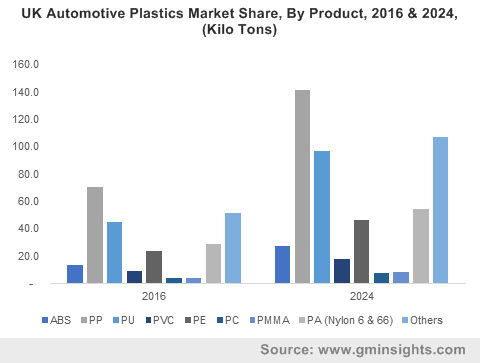 Shifting consumer trends towards lightweight automobiles, improving vehicles aesthetics along with increasing demand for passenger vehicles will drive automotive plastics market demand. Rising trend towards CO2 emission along with increasing environmental concerns has led various manufacturers to focus on lightweight and fuel-efficient vehicle manufacturing. In 2016, the average light vehicle contains about 330 pounds of polymer composites and accounted for over 50% of the total vehicle volume. Automotive plastics are used for performance advancements and safety purposes in commercial vehicles, HMV’s, modern cars and SUV’s. These lightweight products provide fuel efficiency, scratch resistance, component integration, noise control and efficient design molding along with vehicle weight reduction up to 10%. Increasing application scope in fuel systems, electrical components, bonnet components, dashboards, upholstery and body panels allowing passenger safety and convenience along with minimizing manufacturing costs will stimulate industry growth. Strong economic growth coupled with consumer willingness to spend on trendy and stylish vehicles is promoting improved aesthetics in automobiles. Rapid urbanization and industrialization along with increasing demand for passenger vehicles in India and China will drive the automotive plastics market demand. In 2016, China produced over 25 million, Japan with over 8 million and India with over 4 million motor vehicles production. China accounted for about 80% of the total passenger cars market share in 2016. PVC, PU, polyethylene, polyamide, ABS and PMMA are key raw materials used for manufacturing. Crude oil and polymer resins are essential feedstock for polymer production which further goes in automotive plastics manufacturing. Vehicle manufacturing companies lack access to standardized material properties, resulting in improper elastic selections for different application along with strict government norms by EPA regarding waste generation thereby challenging the industry growth. High raw materials availability, low cost and ease of manufacturing has become possible to replace expensive metal & steel counterparts which has led to light weight and less carbon emission in vehicles. PMMA based automotive plastics market size should surpass USD 1.3 billion by 2024. These are highly used in creating various interior and exterior panels, molded parts, trims, number plates along with application in windows, screens and displays owing to its superior characteristics such as impact resistance, UV filtering, chemical resistance, accuracy in color along with weathering properties ensuring product parts durability and longevity. Increasing sustainable polymer demand owing to rising environmental concerns for plastic waste accompanied with stringent government norms may promote product demand. Polyurethane (PU) based automotive plastics industry demand may register gains at over 10% owing to lightweight and excellent durability, increased fuel economy, corrosion resistance, insulation and sound absorption properties. PU foams are used for making head rests, cushioned instrumental panels and arm rests along with various other car interiors thereby stimulating product demand. Acrylonitrile butadiene styrene based automotive plastics market size is witness significant growth at over 9.5% during the forecast timeframe. It is used in manufacturing cars dashboard, instrument panel, covers, bumpers, and body panels. Consumers inclinations towards stylish vehicles owing to weight reduction, toughness, flexibility, and corrosion resistance should drive industry growth. Automotive plastics industry size from power train applications may register gains close to 10% over the foreseeable timeframe. It includes engine, driveshaft, gears, transmission, bearings and every component which stimulates engine’s power into movement. Various automobile manufacturers are engaged in manufacturing plastic materials to minimalize powertrain weight. Automotive plastics industry demand from interior and exterior furnishings should surpass USD 17 billion by 2024. Positive application outlook in dashboard, seating, instrumentation panel along with fascia and bumper will drive the market growth. Increasing environmental consciousness along with rising investments in innovations and creative aesthetics to accentuate the overall appeal of the cars is likely to boost industry growth. Automotive plastics industry size from chassis applications is likely to witness steady gains at over 9% over the forecast period. It acts as a supporting part for light vehicles and provides strength, stability, flexibility, rigidity and crash resistance through energy absorption. It ensures low levels of vibrations, noise and harshness throughout the automobile. Rising number of accidents and consumer emphasis on road safety is likely to drive the industry growth. Europe automotive plastics market size, driven by Germany, Russia, UK and France are poised to exceed USD 14 billion over the projected timeframe. Stringent government guidelines by EU Commission regarding End of Life vehicles along with reducing GHG emissions may favor regional industry growth. Strong focus on R&D spending with OEM’s manufacturers are engaged in designing less expensive product leading to fuel efficiency and reducing overall production costs may favor industry growth in the region. China automotive plastics market size should may register gains close to 10% owing to rapid industrialization and increasing number of passenger cars produced. Rising foreign investment along with increasing demand for passenger vehicles may stimulate industry growth in the region. Automotive OEMs are focusing on the online retail channels in the near future, to help maintain a direct relationship with the buyers. Brazil automotive plastics industry should witness significant growth at over 10.5% up to 2024. Rising domestic autos demand with economic stability has led to rise in car production thereby stimulating industry growth. Companies are developing flex and compact fuel cars to combat consumer needs by adopting lightweight technology in vehicles. 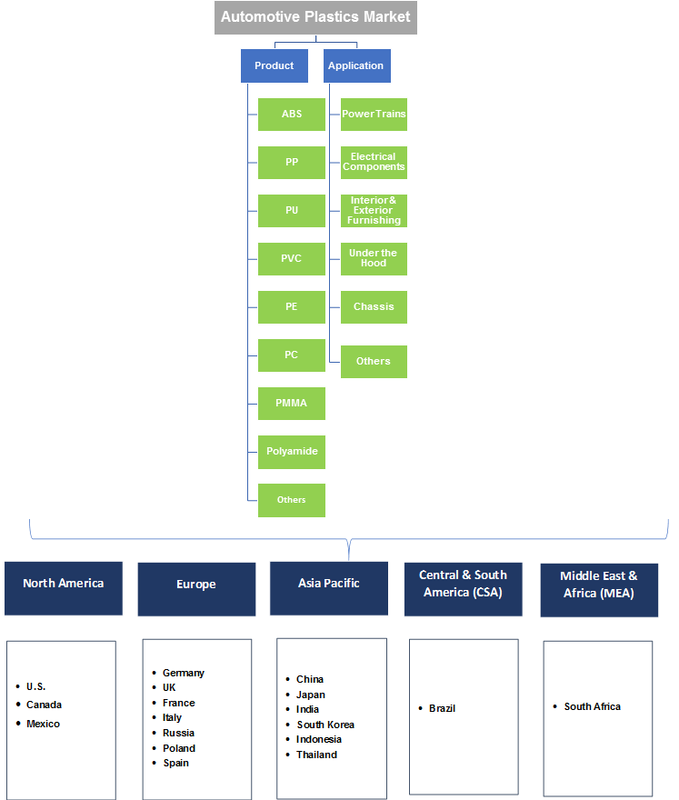 Global automotive plastics market share is moderately consolidated. BASF, Delphi Automotive, Evonik, and Johnson Control are some of the major companies operating in the industry. Companies are investing on R&D for formulating lightweight vehicles and fuel efficiency thereby reducing costs. Also, manufacturers are focusing for further consolidation to enhance their regional presence by forming partnerships and joint ventures to develop new market avenues and stimulate automotive plastics industry demand. Automotive plastics are high performance plastics which are used in transport vehicles offering minimal corrosion allowing flexibility in integrating components, versatility, comfort, safety and longer vehicle life. Plastics are viscoelastic materials which possess characteristics such as high strength, lightweight, elasticity, form stability along with design flexibility. They are cost-effective, durable and easy to mold materials which is promoting its usage in exterior and interior vehicle design. Growing preference towards high performance elastics as a substitute to conventional metals will drive the industry growth. Strong application scope in interior and exterior furnishing, under the hood, power trains, electrical components, and chassis should drive automotive plastics industry size. Increasing beneficial usage and rising consumer demand or passenger vehicles along with the superior properties will drive the industry growth.